LAZAR, E. , PETREUS, D. , ETZ, R. , PATARAU, T.
The paper presents a software solution and communication network used to implement and test management algorithms for different microgrid configurations. The results obtained are represented in a Graphical User Interface (GUI). Data is transferred between the devices and a central processing unit that has a communication protocol interpreter implemented using an RS-485 network. After being interpreted, the raw data containing useful information for the management algorithm is converted in numerical or Boolean values. These values are stored and used by the management algorithms implemented for cost optimization. A microgrid emulator is used for the proof of concept. The software solution and communication network together with the data interpreter can be easily used for other microgrid structures with or without modifications, depending on the number and types of equipment used. In the presented case the microgrid management control algorithm tries to keep the state of charge of the batteries between two values by using efficiently the available resources depicted by: solar energy, geothermal energy, and energy obtained from biomass. The microgrid setup has emulators for the geothermal and biomass generators and a photovoltaic system with storage capability and two inverters, a grid forming capable and a grid follower. 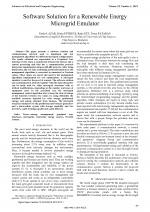 S. M. Dawouda, X. Lin, M. I. Okbaa, "Hybrid renewable microgrid optimization techniques: A review," Renewable and Sustainable Energy Reviews, Vol. 82, Part. 3, pp. 2039-2052, 2018. A. G. Lupu, A. Dumencu, M. V. Atanasiu, C. E. Panaite, Gh. Dumitrascu, A. Popescu, "SWOT analysis of the renewable energy sources in Romania  case study: solar energy", 7th International Conference on Advanced Concepts in Mechanical Engineering, IOP Conf. Series: Materials Science and Engineering Vol. 147, pp. 1-10, 2016. M. Javad Kasaei, M. Gandomkar, J. Nikoukar, "Optimal management of renewable energy sources by virtual power plant", Renewable Energy, Vol. 114, pp. 1180-1188, 2017. M. L. Tuballa, M. L. Abundo, "A review of the development of Smart Grid technologies", Renewable and Sustainable Energy Reviews Vol. 59, pp. 710-725, 2016. E. Mengelkamp, J. Garttner, K. Rock, S. Kessler, L. Orsini, C. Weinhardt, "Designing microgrid energy markets: A case study: The Brooklyn Microgrid", Applied Energy, Vol. 210, pp. 870-880, 2017. M. Smaoui, L. Krichen, "Control, energy management and performance evaluation of desalination unit based renewable energies using a graphical user interface", Energy, Vol. 114, pp. 1187-1206, 2016. I. Gonzalez, A. J. Calderon, J. M. Anduj, "Novel remote monitoring platform for RES-hydrogen based smart microgrid", Energy Conversion and Management, Vol. 148, pp. 489-505, 2017. M. E. Khodayar, "Rural electrification and expansion planning of off-grid microgrids", The Electricity Journal, Vol. 30, pp. 65-74, 2017. T. Adefarati, R. C. Bansal, "Reliability and economic assessment of a microgrid power system with the integration of renewable energy resources", Applied Energy, Vol. 206, pp. 911-933, 2017. H. Morais, P. Kadar, P. Faria, Z. A. Vale, H. M. Khodr, "Optimal scheduling of a renewable micro-grid in an isolated load area using mixed-integer linear programming", Renewable Energy, Vol. 35, pp. 151-156, 2010. H. Ren, W. Gao, "A MILP model for integrated plan and evaluation of distributed energy systems", Applied Energy, Vol. 87, pp. 1001-1014, 2010. P. Garciaa, J. P. Torreglosa, L. M. Fernandez, F. Juradoc, R. Langella, A. Testa, "Energy management system based on techno-economic optimization for microgrids", Electric Power Systems Research, Vol. 131, pp. 49-59, 2016. E. Lazar, D. Petreus, R. Etz, T. Patarau, "Minimization of operational cost for an Islanded Microgrid using a real coded Genetic Algorithm and a Mixed Integer Linear Programming method", 2017 International Conference on Optimization of Electrical and Electronic Equipment (OPTIM) & 2017 Intl Aegean Conference on Electrical Machines and Power Electronics (ACEMP), Brasov, Romania, 25-27, May, pp. 693-698, 2017. X. Lu, K. Zhou, S. Yang, "Multi-objective optimal dispatch of microgrid containing electric vehicles", Journal of Cleaner Production, Vol. 165, pp. 1572-1581, 2017. M. S. Fakhar, S. A. R. Kashif, M. A. Saqib, T. Hassan, "Non cascaded short-term hydro-thermal scheduling using fully-informed particle swarm optimization", Electrical Power and Energy Systems, Vol. 73, pp. 983-990, 2015. C. Roldan-Blay, G. Escriva-Escriva, C.Roldan-Porta, C. Alvarez-Bel, "An optimisation algorithm for distributed energy resources management in micro-scale energy hubs", Energy, Vol.132, 126-135, 2017. M. Marzband, A. Sumper, A. Ruiz-Alvarez, J. L. Dominguez-Garcia, B. Tomoiaga, "Experimental evaluation of a real time energy management system for stand-alone microgrids in day-ahead markets", Applied Energy, vol. 106, pp. 365-376, 2013. R. Etz, D. Petreus, T. Patarau, E. Lazar, "An islanded renewable energy microgrid emulator for geothermal, biogas, photovoltaic and lead acid battery storage", 2017 IEEE 26th International Symposium on Industrial Electronics (ISIE), Edinburgh, UK, pp. 21092114, 1921 June 2017. M. Marzband, E. Yousefnejad, A. Sumper, J. Luis Dominguez-Garcia, "Real time experimental implementation of optimum energy management system in standalone Microgrid by using multi-layer ant colony optimization", Electrical Power and Energy System, Vol. 75, pp. 265-274, 2016. M. Elsied, A. Oukaour, T. Youssef, H. Gualous, O. Mohammed, "An advanced real time energy management system for microgrids", Energy, Vol. 114, pp. 742-752, 2016. 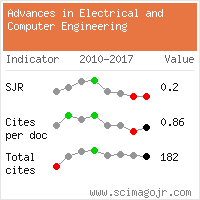 Citations for references updated on 2019-04-22 03:43 in 140 seconds.